There is a tribe of people living in Mali, West Africa, known as the Dogon. What is interesting about these people is that they possess knowledge of our solar system and a neighboring star, Sirius, which appears as a bluish star just above the northern horizon in the northern hemisphere during the winter months. It is part of the constellation Orion. In addition to knowing about Sirius, the Dogon also know that this distant star has a companion star that appears to be a dim white dwarf that has a 50-year elliptical orbit about Sirius. This companion star is extremely heavy and rotates on its axis. While the Dogon have been telling this story for hundreds of years, it was not until the 1930s when astronomers discovered the fabled companion star and learned that everything the Dogon said about it was correct. How did they know? The Dogon also knew that the planets in our own solar system circled around the sun, that the planet Jupiter has four major moons and Saturn has rings. This was not proven until Galileo invented the telescope. The Dogon legend also claims that an infinite number of stars with worlds like Earth circling them exist in the Universe, and that all types of living creatures live on many of the planets. So how did a primitive tribe in the wilds of Africa learn such information? They tell about the Nommo, an alien race that arrived from the sky in a whirling craft and taught the people about Sirus and the planets in our own solar system. They say the people would assemble around a lake that was created around the ship while the Nommo "preached" to them. 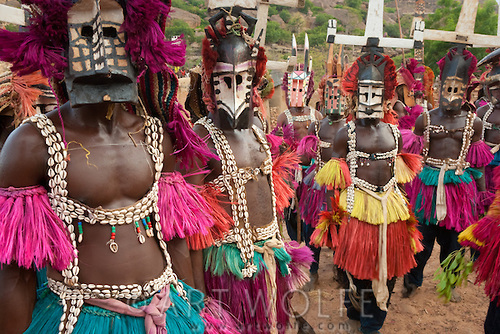 The Dogon lore is said to date back thousands of years to 3200 BC. They describe the Nommo as ugly amphibious beings that looked like mermaids and mermen, with scales all over their bodies. Similar legends about an ancient race of reptilians as told in legends from Babylonia and Sumeria. Even the Egyptian Goddess Isis has been depicted as a mermaid. Were the Nimmos known to these ancient civilizations? Old names for alien visitors, taken from ancient text, include Nibiru and Anunnaki.